In today's world of social media customer service and instant communication, consumers are getting more demanding about response times from companies. Law firms are no different from any other business when it comes to prompt response to customer inquiries, and if you're taking more than a few minutes to respond to web leads, your potential client could already be talking to a more responsive firm. Most decisions to hire legal counsel come in the aftermath of a serious life event. More often than not, it's a negative event such as a divorce notice from a spouse or a wrongful death of a family member. Therefore, most of your web leads are coming from people who are desperate for help and in a highly emotional state. Emotions can prompt us to make rash decisions, and that decision may very well be to hire the first attorney who responds to us. If your staff isn't on the ball answering web leads, the highly emotional client could slip into another panic mode and go on to the next attorney's website for help. Imagine the surprise on a potential client's face when a few moments after hitting the "submit" button they're alerted to a welcome message from your law firm in their inbox. Alternatively, they could be caught off guard (in a good way) when a representative of your firm calls them almost immediately after submitting their web form to set up a time for a consultation. With a quick response comes confidence in your law firm's abilities to handle clients with care and concern. Instant responses make clients feel like they're getting the VIP treatment. Web leads can come in any time--day or night, weekend, or holiday. You can't expect your office staff to be there 24/7 checking your emails, nor can you expect your staff to answer emails during off-hours. However, you CAN expect these services from Alert Communications. 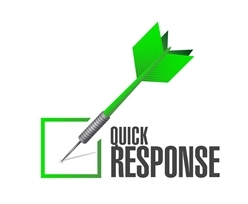 Alert Communications can respond to your web leads in a number of ways. They have automated email campaigns that can send a customized welcome email, complete with intake forms. Or if you'd rather jump right into a consultation, their phone operators can follow up with an appointment call to set your first meeting. The choice is yours—do you want fast response to web leads, or do you want to let the next big case slip through your fingers because you waited until the next business day to answer that call? To get started with Alert Communications, visit the contact page on their website or give them a call at 800-801-7628.